Roberson’s Funeral Home, of South Shore, donated a plaque to commemorate Tyler Hughes’ Eagle Scout project. 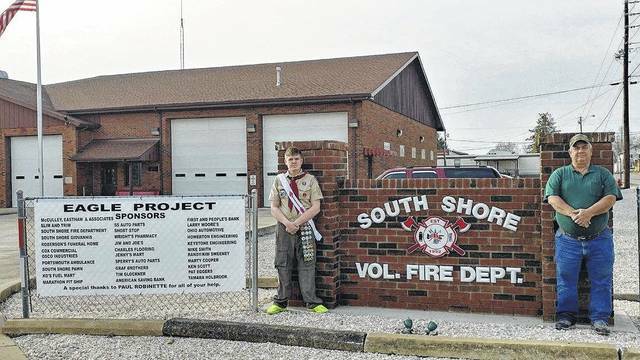 Work on the South Shore signage was completed by Tyler Hughes (right), Paul Robinette (left) and Boy Scout Troop 98. Everyone faces adversity, but few continue to push towards what may seem impossible goals-goals set in the service of others. Tyler Hughes, 17, of South Shore, Ky., officially became an Eagle Scout during a ceremony held Tuesday evening. Like other young men working towards such a rank, Hughes had to put in long hours completing projects to earn 21 merit badges and a service project. Excelling along the way, Hughes has also been recognized with the Order of the Arrow, a designation best described as a honor society for Boy Scouts. All of this work has been done for one purpose. Hughes has dreams of joining the military. In addition to becoming an Eagle Scout, Hughes has also completed four years of the ROTC program at Greenup Co. Schools. Both accomplishments help new military recruits gain rank. With a possible limitation standing in the way of his dreams, the determined Scout has considered any advantage that may help him serve his country. Two years ago, Hughes underwent neck surgery neck surgery that included removal of the base of his spine in order to correct an uncommon medical condition – Chiari malformation. Chiari malformation is when brain tissue extends into the spinal cord. Those who suffer from Chiari malformation may have symptoms as severe as headaches, neck pain, numbness and tingling in limbs, dizziness, vision and speech problems, curvature of the spinal cord and breathing difficulties. Since Hughes no longer has the Chiari malformation diagnosis because of the corrective surgery, he and his family hope that his medical history will not limit his enlistment. He added that his first goal is to join the Army; however, he will be happy in any branch. Motivated by the strong male role models in his life, Hughes explained that his grandfather was drafted for Vietnam and his uncle was in the Army and is now in the reserves. Still, much of the appeal of the military is the opportunity it presents for Hughes to do for others. She added that Boy Scouts has really helped Tyler to grow as a person. The proud mom also said that she has watched her son become more of a leader as he has progress through Boy Scouts. In keeping with his character, for his Eagle Scout service project, Tyler chose to help the local fire department made up of people who risk their lives for others everyday. Tyler’s step-father Eric Sweeney is a firefighter with the South Shore Local Fire Department and has shown Tyler just how much firefighters do in service of the community. The response was that they really needed some kind of signage out front. Immediately, Tyler committed to getting a brick sign out front of the fire department. He was able to get the full cost of $2,605.66 covered by donations. The cost was strictly for materials. All labor was also donated. In fact, with the assistance of long-time firefighter Paul Robinette, Tyler completed much of the work himself. Robinette worked alongside Tyler to show him how to pour concrete and complete the masonry. Tyler also brought in other Scouts from Troop 98 to help. Donations for the project came from Slim and Trim, South Shore Giovannis, South Shore Fire Department, Roberson’s Funeral Home, Cox Commercial, Osco Industries, Portsmouth Ambulance, South Shore Pawn, KD’s Fuel Mart, Marathon Pit Shop, SS Autoparts, Short Stop, Wright’s Pharmacy, Jim and Joe’s, Charles Flooring, Jenny’s Mart, Sperry’s Auto Parts, Graf Brothers, Tim Glockner, American Savings Bank, First and Peoples Bank, Larry Moore’s, Ohio Automotive, Howerton Engineering, Keystone Printing, Randy/Kim Sweeney, Mike Smith, Marty Cooper, Pat Eggers, Ken Scott, Tamara Holbrook and McCulley Eastom and Associates. Roberson’s Funeral Home also donated a plaque recognizing Tyler for completing the project.